Effie Galletly shows images of her work online, highlighting those pieces inspired by the landscapes and structures of the Western Islands and Western Highlands of Scotland. "The Hebridean Islands strike a powerful chord with me and set in motion ideas that I feel compelled to express." From a short distance, the work looks like painting. The method of making is entirely like that of a traditional quilt. Over the last decade Effie has produced a substantial body of work focused on Scottish landscape. A number of the works in the galleries are now in private collections. Those still available can be found in all the galleries and can be recognised by the fact that their prices are still there in the information slot. You will find an article, Another Bend in the Road, written by Effie about her work, on the Articles page. It was written for The Quilter (journal of the Quilters' Guild of the British Isles) for their Spring issue 2016. 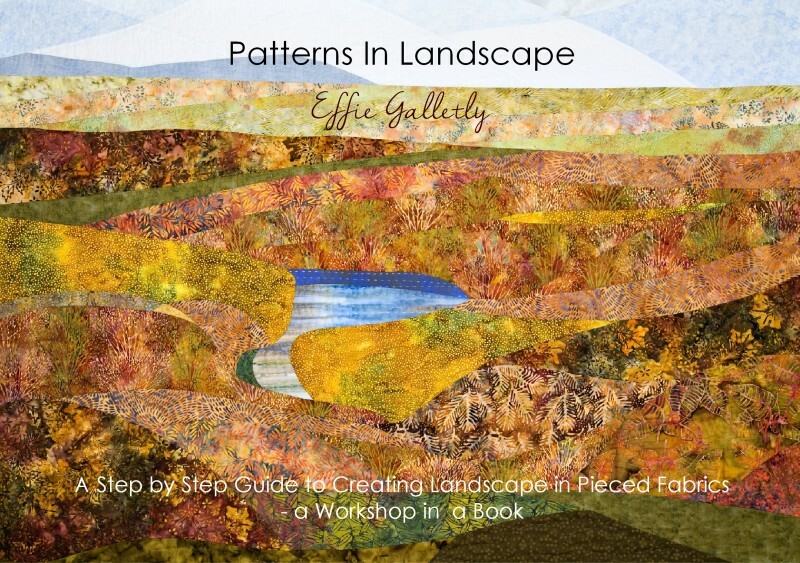 Effie's book, Patterns in Landscape, is now available in the website shop as well as two locations - Seallam! Visitor Centre on the Isle of Harris and Midsomer Quilting in Chilcompton, Somerset. The book looks beautiful. The photography of the colours, textures and stitching is great and having it as a paperback makes it very accessible. The way you handle and build up the topics is very imaginative and I think would be useful to a number of practitioners in different fields as well as textiles. Each chapter and page is like a building block, and the student is gently and continually reminded and reinforced with all that has gone before. People really struggle with composition and tone but you make it seem achievable, and very helpful when dealing with colour. I loved your graded squares like a Paul Klee painting! Your work is all about light to me so marvellous to have parellels drawn to painters and catching the light at different times of day. Also the importance of a passion for a place and to have a sense of place. I found Effie's beautifully presented book so easy to read. She guides the wannabe landscape quilter in very clear steps from the initial concept through development to execution. Each part of the process is detailed with clear instruction on how to choose the subject matter, how to handle perspective, scale, colour and fabric, all the while encouraging individuality. Effie's classes at MQ have always been popular and inspirational and Patterns in Landscape is bound to be the same. If you can't get to one of her workshops, this really is the next best thing - and if you have then you'll probably want it, too!